This book has everything that you’d expect from the best of the ‘Campaign Chronicle’ series and one written by a man who is one of the leading ‘young bloods’ of Napoleonic history, Alexander Mikaberidze. Mikaberidze’s lucid writing style enables the reader to easily follow the key events and to understand causes and effects. For example, in the 'Background', which covers causes of the war and the opening manoeuvres, he clearly describes what are often a confusing series of marches, retreats, separate armies and wings and failed enveloping manoeuvres. 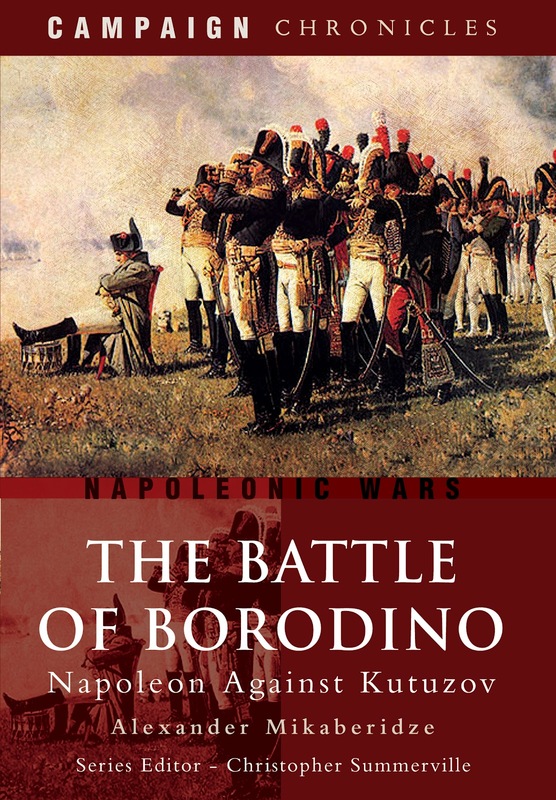 The bulk of the book is the ‘Campaign Chronicle’ which details the campaign in small, detailed sections, beginning with the unification of the Russian armies in early August and the manoeuvring to the battlefield of Borodino. Particularly pleasing, and somewhat of a bonus, are the 19 pages dedicated to a description of the Battle of Shervardino that preceded Borodino and gave a clear indication of the struggle that was to come two days later. This is followed by a detailed section on the armies and leaders, which includes a listing of various estimates, from a range of sources and authors, of the numbers present in the two armies, plus tables and graphs of the ages and years of experience of the officer corps of the two adversaries. The next section ‘Eve of the Bloodbath’ describes the battlefield, the plans of the commanders and distributions of the armies. It also includes detailed descriptions of the fortifications that were built by the Russians, complete with accompanying diagrams, which are particularly useful for wargamers and modellers. The epic battle itself is broken into three phases (6 am to 12 am (sic), 12 am (sic) to 6 pm, 6 pm to 12 pm (sic)), in all comprising 114 of the 276 pages. Mikaberidze describes all of the key aspects of the battle, providing an overview of the action down to the detail of the units involved in specific combats. The text is interspersed, as is the entire book, with quotes from generals and soldiers (and civilians) which add greatly to the description and combine to provide a clear, detailed and impactful description. The final part of the book ‘Aftermath’ deals mainly (and appropriately) with the direct aftermath of the battle, observations of the survivors, assessments of the outcome, the terrible casualty lists on both sides and the grisly charge of burying the dead. It is rounded off by seven pages on the remainder of the 1812 campaign and the legacy of Borodino. The text throughout is clear and readable. Where appropriate and particularly early on in the book, Mikaberidze includes clarifying text in parentheses. Such text includes information such as who a particular person was, or the alternative names for a location or a battle, or the background to a statement in a quote. This provides clarity for the reader and I found it particularly helpful and useful. The appendices comprise orders of battle (OBs) for the two armies and a glossary of terms. The OBs list the higher level commanders in each army, corps, division and brigade and the units in each of the latter. More complete versions of the OBs are freely available on the Napoleon Series website. These OBs there also include details of each unit and unit commander, plus numbers of battalions or squadrons. There are also estimated totals of troops for each corps, plus the staff for the armies, corps and divisions. 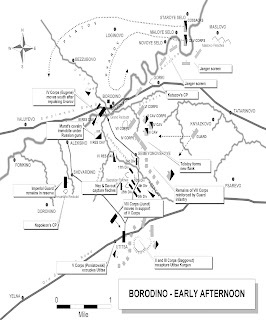 The front pages of the book contain six excellent, detailed maps of Borodino showing the terrain, initial dispositions, positions at early afternoon and a detailed look at the attacks on the grand redoubt. 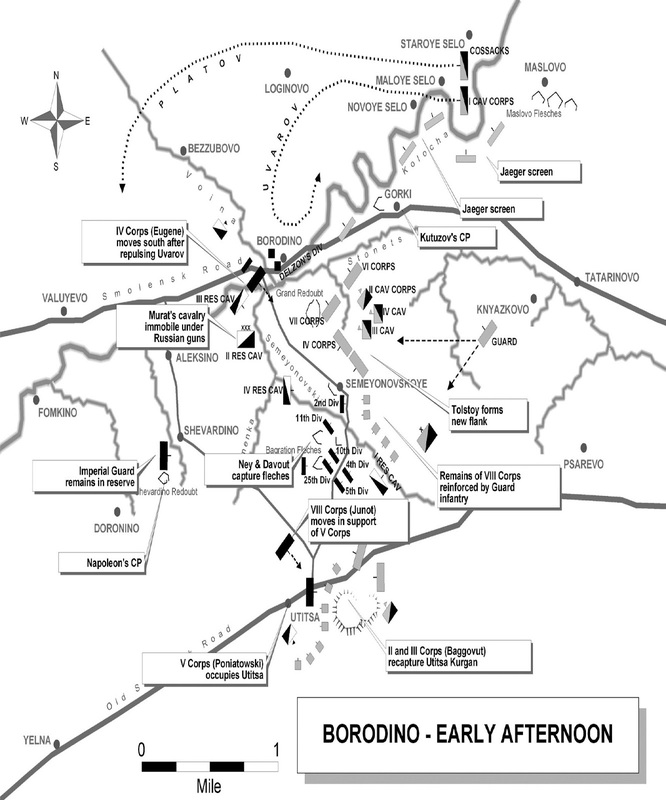 There are two, less detailed maps that provide an overview of the early stages of the campaign and of the troop movements from Borodino to Moscow. Unfortunately, there is not a separate map to support the description of the Battle of Shevardino. Twenty four pages of plates provide a selection of portraits of commanders, troops, reproductions of paintings and photos of sections of the battlefield. All are in black and white, but are reproduced clearly and vividly. This is an invaluable source and a good read. 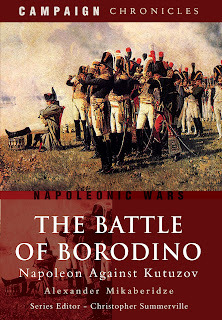 We used this book as one of the main sources in designing our Borodino scenario and will use it as the main source for a Shevardino game. I concur fully, Barry made much use of this source and I bought my own copy several months ago very inexpensively from Amazon - well worth it as I fine tuned some aspects of the OOB and scenario, as well as enjoyable book all by itself. If only Nafziger could write half as clearly as Mikaberidze!